When Davidson had a strong spring many wondered aloud whether or not he’d be opening the season with the White Sox. Smarter people knew that wasn’t going to happen, as the Sox could delay Davidson’s eventual free agency for another year if they kept him in Charlotte until some time in June. So when the season began and Davidson was in Charlotte, it didn’t come as a surprise. 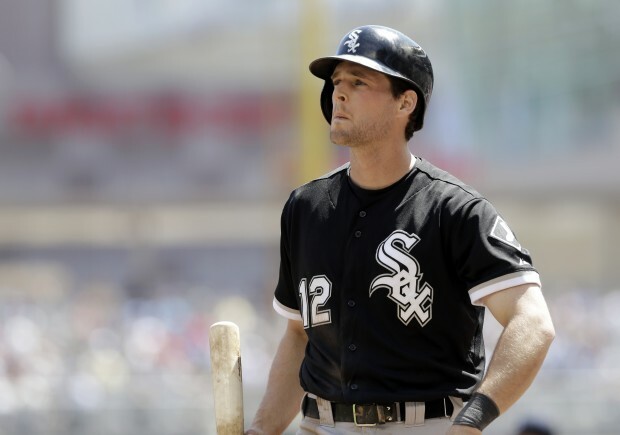 Meanwhile, Conor Gillaspie, who proved to be an adequate third baseman for the Sox in 2013, would serve in a platoon at third base along with Marcus Semien — another young infield prospect that was deemed part of the future — until Davidson came along and took over the job. Gillaspie’s future was less certain, and considering the Sox picked him up for a minor leaguer in Jeff Soptic in Feb. 2013, it’s not like they’d paid a hefty price for him. A DFA was certainly possible. But then 2014 started and Gillaspie has given Rick Hahn a good problem to have. While Jose Abreu has awed fans with his power, Alexei Ramirez has been deemed the team’s MVP and the greatest shortstop of all time by Hawk Harrelson, and Hawk’s also christened Adam Eaton as the sparkplug, Gillaspie might just be the best hitter the Sox have in the lineup right now. Gillaspie spent some time on the disabled list this year — going on the DL is a team bonding exercise this season for the Sox — but when he’s been in the lineup, he’s been very strong. In 27 games Gillaspie has put up a line of .347/.389/.455. His batting average and on-base percentage are the best on the team, while his OPS of .845 is third-best, trailing only Abreu and Adam Dunn. And I laughed when I saw the White Sox opening day lineup had Gillaspie hitting third, but apart from a lack of home run power, he’s been perfect for the spot. Gillaspie’s done all this while playing adequate defense at third as well. He’s not a gold glover, but he’s not hurting the Sox defense, either. He’s basically just been league average at the position. Now, being the eternal pessimist that I am, I tried to figure out how this “fluke” was occurring, but even after digging, I’m not sure it’s a fluke. Conor Gillaspie might just be figuring things out. The first thing I noticed was Gillaspie’s BABIP, which is abnormally high at .402. Last season Gillaspie was at .270. That BABIP is going to come down at some point, but looking at the other peripherals, I’m not sure how drastic the drop will be. Just about every other peripheral stat is in line with what Gillaspie did last season. He’s striking out slightly less often, he’s walking at the same rate, he’s got the same groundball/flyball ratio and he’s seeing the same number of pitches in his at bats. So what’s different? It’s the contact and approach based on what I see in the numbers. First of all, Gillaspie has a line drive rate of 40% this year (40% of the balls he’s putting in play are line drives), and that’s certainly going to help one’s BABIP. Last season he checked in at 23%. The other thing I noticed is that, while he’s seeing slightly more strikes this season (61.9% of the pitches he saw last year were strikes compared to 64.2% this year), he’s being a lot more aggressive on the strikes he does see. In 2012 Gillaspie saw 1,009 strikes and looked at 27% of them without swinging. This year he’s looked at only 19.9% of the strikes tallied against him. He’s swinging more often, and when he is swinging, he’s making contact. He’s also swinging at more first pitches, as he’s swinging at the first pitch in his at bat 31% of the time, compared to only 22.6% of the time in 2012. Also, in 452 plate appearances last year, Gillaspie saw a 3-0 count 24 times, and had a 2-0 count 60 times. So far this year he’s seen two 3-0 counts and seven 2-0 counts. Were he to make another 452 PA at that rate this year, he’d finish with eight 3-0 counts and 28 2-0 counts. Now while this seems like a less patient hitter, remember that his walk rate is at 8.0%, which isn’t far below the MLB rate of 8.4%. What all of this tells me is that Gillaspie isn’t swinging at bad pitches, and he’s jumping on anything he’s deemed hittable. And, most importantly, he’s hitting what he deems hittable. He’s had a bit of a power outage while doing so as far as home runs are concerned, but he’s already hit nine doubles after only hitting 14 all of last season. And it’s hard to complain about his lack of home runs when he’s getting on base damn near 40% of the time and he still has an OPS+ of 131. While all of this has gone on with Gillaspie in Chicago, things haven’t gone nearly as well for Matt Davidson in Charlotte. In fact, he’s really struggled. Through 37 games with the Knights Davidson has a line of .193/.250/.341. Davidson has always been projected as a bit of a three true outcomes hitter, but so far he’s stuck in only one of those destinations. He’s struck out in 57 of his 148 PA in Charlotte, or 38.5% of the time he steps to the plate. He’s also walking less, and not showing nearly as much power. So, like I said, he’s struggling. And that makes me wonder if Rick Hahn isn’t changing his plans for the White Sox this summer. After 47 games the Sox have a record of 23-24, which is exactly the same record the team had after 47 games last season. The difference is that this Sox team has put up a respectable record while dealing with injuries to key players. While it doesn’t look like this team has any hope of catching Detroit in the AL Central, it’s only 1.5 games out of one of the wild card spots. As insane as it sounds, once this team gets healthy, and assuming it stays healthy when it does, the White Sox could actually find themselves in contention for a playoff spot this summer. If that’s the case you have to think Rick Hahn is going to want to stick with the third baseman that’s currently getting on base 39% of the time in the Majors rather than 25% of the time in Triple-A. And let’s not forget that Conor Gillaspie will just be turning 27 this July, and like Davidson he’s a former late first round draft pick (Gillaspie went 37th in 2008, Davidson 35th in 2009). He isn’t eligible for arbitration until after next season, and he won’t be a free agent until after 2018. It’s entirely possible that the stopgap of the present could become the answer for the future. This entry was posted in Chicago White Sox and tagged Adam Dunn, Adam Eaton, Addison Reed, Alexei Ramirez, Conor Gillaspie, Hawk Harrelson, Jose Abreu, Marcus Semien, Matt Davidson, Rick Hahn by Tom Fornelli. Bookmark the permalink.